Located in the parish of Pembroke and not actually Hamilton parish, the city of Hamilton is the only full-on city found on Bermuda and is flush with restaurants, shops and nightlife venues. It replaced St. George's as capital in 1815, and tourism bolstered the local economy in the decades that followed, helped by the city's proximity to gorgeous pink-sandy beaches. 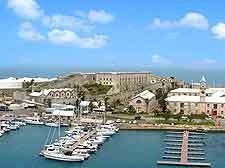 Today, tourists who arrive by sea are most likely to land in Hamilton Harbour, although during the summer months the old Royal Naval Dockyard also sees the arrival of cruise liners. As you arrive, you can glean tourist information from the ferry terminal before heading out to explore. 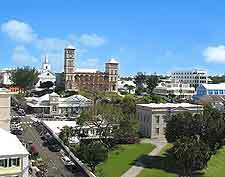 Hamilton is the most convenient place to be based as it is equidistance from every corner of Bermuda. 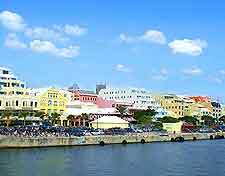 The city also has the best selection of hotels and a thorough transportation network that sends public buses and taxis to every quarter of the island. Hamilton is a well-planned and thought-out city, with its organised gridwork of streets spread around the hillside, which leads upwards from Front Street - a lively waterfront boulevard. The main tourist attractions are scattered around the compact city, being best reached on foot. For a leisurely stroll on a sunny afternoon, the Bermuda Botanical Gardens and their woodland trails are quite special and located close to the Hungry Bay Nature Reserve. Barr's Bay Park, Par-la-Ville Park and Victoria Park also provide further green spaces, as does the Blue Hole Park, which is situated next to the Harrington Sound. Just across the waterfront and within the neighbouring parish of Warwick, the Belmont Hills Golf Club is the nearest golf course to Hamilton and offers stunning ocean views as you play. 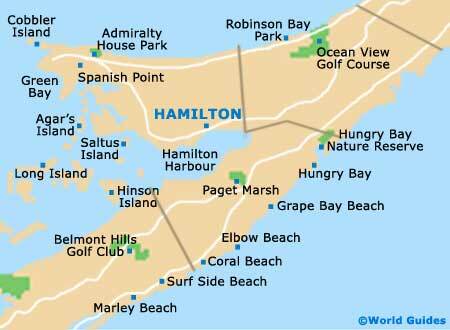 More information about Hamilton Tourist Attractions. A number of important landmarks and buildings grace the cityscape of Hamilton, often dating back to its affluent Victorian period. Fort Hamilton is one of the most recognisable and is especially popular with tourists, featuring underground passageways, huge cannons, fortifications, landscaped gardens and superb elevated views. 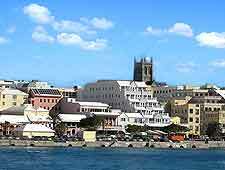 The Anglican Cathedral of the Most Holy Trinity (Bermuda Cathedral) is especially famous, dating back to 1844 and being rebuilt soonafter at the request of Queen Victoria, following substantial fire damage. Finally completed in 1897, it is this cathedral that earned Hamilton its status of city. A few decades later saw the arrival of the Roman Catholic St. Theresa's Cathedral, where the annual Santo Cristo procession still draws large crowds. Sessions House is another historic building of note and first opened its doors to the House of Assembly and Supreme Court in 1817, meaning that it is currently the most historic parliament to meet in the entire western hemisphere. More information about Hamilton Landmarks and Monuments. 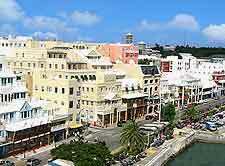 With Bermuda being a relatively small island country, it is quite feasible to visit any part during your holiday. However, it is important to bear in mind at car rental is not an option here. Instead, you will either have to hire a scooter, or rely on bus transport and taxis. 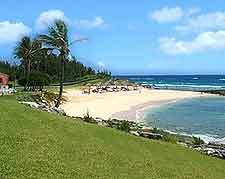 Close by and on the north-eastern side of Bermuda is Smith's parish, where attractions include Flatts Village, the Spittal Pond Nature Reserve and John Smith's Bay. To the south-west, the parish of Southampton is where you will find the enticing beach of Horseshoe Bay, which is simply stunning and boasts soft powdery sand, crystal clear waters and a number of adjacent coastal trails, such as the pathway connecting South Shore Park with Warwick Long Bay. On the far north-eastern side of Bermuda is St. George's parish, where King's Square in St. George's Town is central to local life. Also here is Somers Garden, an authentic replica of HMS Deliverance and Tobacco Bay Beach. More information about Hamilton Attractions Nearby.